Dr. Mansi is one of the leading periodontist in Ahmedabad Gujrat has extensive clinical experience. She is running her own dental clinic in ahmedabad name Dr.Mansi Dental Clinic. let me show some lights on gum diseases or periodontal disease. Many people have problem of bleeding gums, pain and swelling in gum line. These are the signs that your gums are infected by bacteria which are gradually making them weak. This kind of infection can get severe and even spoil the whole jaw structure if not get treated in the nick of time. After sometime, your teeth will get loosely bound to the gum and will be ultimately decayed. These kinds of infections around the teeth that cause serious oral problems are regarded as Periodontal Diseases. 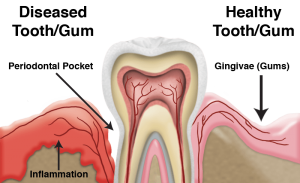 The term “Periodontal” defines itself as “Perio” means “around” and “dontal” refers to dental. Periodontal diseases affects your gum-line, periodontal ligaments along with the alveolar bone, making the tissues weakly bound and hence, you face pain, swelling, and sometimes problem of bleeding gums in the major stages of infection. The prime reason behind periodontal diseases is the dental plaque that invites various types of bacteria to home in. A thick layer that gradually builds up on your teeth is known as plaque. To prevent bacteria production in the plaque, the immune system of your body starts releasing substances that somehow inflame and damage your gums as well, being strong. You soon started having pain and swelling in gums which are the sign of gingivitis (an earlier stage of periodontal diseases). Besides plaque, there are several other major factors that either cause or accelerate the effect of periodontal diseases as listed below. 1- Genetic :If you are having periodontal disease and your ancestors too had this problem, then this must be the case of genetically adapting the problem. However, it can be healed and cured if treated properly. 2- Overcrowded Tooth: Overcrowded or crooked teeth sometimes lead to major periodontal problems. To prevent or cure these issues, the specialist may suggest you orthodontics. 4-Teeth grinding:If you are already inflamed and you have a habit of grinding or clenching teeth, then it may lead to sever gum problems. The habit of clenching or grinding teeth exerts more pressure on teeth and hence periodontal ligaments and bones easily get damaged. This leads to gum bleeding and swelling. 5- Stress and hormonal imbalance : We all know that stress weaken our immune system and causes hormonal imbalance in body which definitely leave a worse impact on our oral structure as because of weak immune system, our hormones fails to prevent our gums from harmful bacteria that cause serious gum diseases. 6-Excessive use of medicines : Excessive use of medicines makes our mouth dry as it includes certain types of pharmaceutical drugs. Medicines that are specially used in case of depression and high blood pressure have high percentage of pharmaceutical drugs. These drugs reduce the percentage of saliva in mouth which is necessary to prevent building of plaque and hence periodontal diseases. Medicines such as Phenytoin, Cyclosporine, Nifedipine etc. are counted amongst such pharmaceutical drugs. If periodontal diseases are not cured in time, they may lead to severe oral problems, deeply affecting the gum line area, periodontal ligaments and bones that may ultimately lead to weak teeth, jawbone, and deeper pockets, bleeding and swelling problems. Sometimes the disease takes such a major form that you have to go for surgical treatment. The primitive treatment in case of periodontal disease is tooth scaling and root planning. In this treatment, the plaque that has been built on your teeth is removed by tiny dental tools and the roots are smooth to prevent bacteria in your gum pockets. Post, tooth scaling and root planning, it gets easier for teeth to re-attach to the gums and the dentist will guide you to follow healthy oral habits and occasional visits to the dental centre. Pocket Reduction :Periodontal pocket reduction or flap surgery is performed in cases when it is hard to get off plaque from deeper pockets through normal tooth scaling and tooth planning processes. With this process, it gets easier to let the teeth re–attach to the healthy gum line and bone. Gum Grafting :Due to recession of gums, the roots are exposed and therefore have greater chances of getting infected from bacteria which ultimately leads to loosen gums area and teeth start falling. To prevent such situation, dental specialists suggest applying gum grafts to cover the exposed roots. In this process, gum tissues are taken from your palate or another area which is used to cover the roots. This treatment reduces the gums sensitivity and protects roots from decaying along with more gum recession. At present, the nation is developing in medical zone as well and we are having experienced dental specialist at an arm’s length that were hard to find few years ago. Today, we have solution of almost all types of oral diseases which can be cured of with the help of latest technology implementation in medical field under the guidance of skilled dental specialists. Dr. Mansi’s dental clinic at Ahmedabad is a place where you can find a solution of all your oral problems that will be treated by skilled and experienced dental specialists and that too in the most affordable prices. So if you have any problem regarding gums, teeth or mouth, visit to Dr. Mansi’s clinic and get all your problems resolved in a fraction of time. Best Periodontist in Satellite Ahmedabad Gujarat India.